Lampasso had a breakaway opportunity but Jurusik with a slick glove save. And a nice save by Jurasik on a breakaway chance for Ohio State's Christian Lampasso. OSU kills off the penalty and teams are back to even strength. We are still scoreless with 8:55 to go in the first. 4:31 to go in the first and it's 0-0 between UW and OSU. Badgers lead in shots 7-5. 4:31 left. 7-5 in shots. Wisconsin is playing a sharp period. Wagner gets mixed up in a little scrum at the OSU net. A fight at the MSG would be pretty fun. Ohio State going on the power play. Wisconsin goes on the kill. Frederic sent to the box. UW's Trent Frederic goes to the box for high sticking. Frederic is sent to the box for high sticking with 3:55 to play in the period. UW will be on the PK for the first time in the game. UW takes a 1-0 lead with 1:45 left in the 1st, scoring on a 2-on-1. Aiden Cavallini just scored a goal in Madison Square Garden. This is a real thing that just happened. GOAL: Badgers take a 1-0 lead at 18:15 of the first period on a shorthanded goal by Aidan Cavallini. Aidan Cavallini picking corners? Now I've seen everything. I'm sad @ToddMilewski wasn't here for that. Incredible. Not a shorthanded goal. UW was back at full strength. My bad. Second goal of the season for Cavallini, by the way. 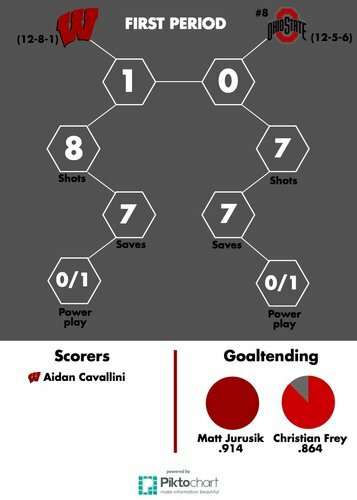 End of the first period: #Badgers lead 1-0 on Aidan Cavallini's second goal of the season. Badgers lead the Buckeyes 1-0 after the first 20 minutes. 1-0 @BadgerMHockey after 1 on a bleeping Aidan Cavallini goal. Of all the things I thought I'd see in NYC, that was not one. ☝️ period down. ✌️ to go. Kunin with a good chance on a tip-in to start second. Teams back out for the second period. Badgers lead 1-0. And Corbin McGuire, the guy who grew up just outside NYC and was coached by Mark Messier, had a beautiful opportunity to bury one. Another power play for UW. Moser off for elbowing. 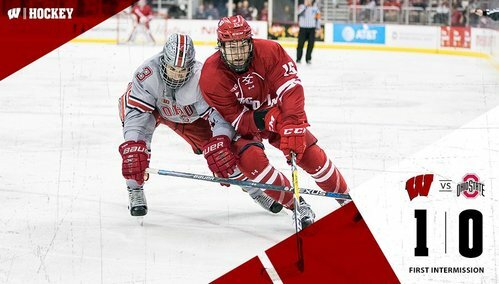 OSU 0; UW 1. 16:44 left/2nd. Buckeyes on the PK for the second time. Good pressure to start the period for UW and they draw an elbowing call. 16:44 left in the second as the Badgers head to the power play. 29 seconds left in the power play. Besse had a chance but Frey with a nice save.